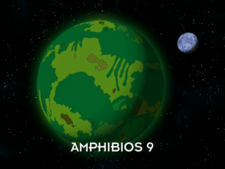 Amphibios 9 is a swampy, green planet, known as the "jewel of the swamp galaxy",[WoT] is the home planet of the Amphibiosans. Its surface consists mainly of swamps and dangerous rainforests, and it is inhabited by wildlife such as "poisonous froads," snakes, and large predatory insects. The planet also has one asteroid-like moon. Amphibiosans traditionally give birth to their young at their family/clan's birthing grounds in a ceremony led by the Grand Midwife. In 2003, Kif Kroker touched Turanga Leela's hand while she was rescuing him from being sucked into space through a hole in the hull of the Nimbus. As he was in his "receptive state", due to his smizmar Amy Wong, he became pregnant with offspring that were the genetic combination of DNA from himself and Leela. The Planet Express ship took him to Amphibios 9, where he went to his clan's sacred birthing grounds, where the Grand Midwife held a ceremony in which he gave birth to several offspring. As Kif's smizmar, Amy adopted the babies, although as Amphibiosans, they don't need parents to actively raise them as they are self-sufficient. They'll remain in the swamp at Clan Kroker's sacred birthing grounds until 3023, when they'll sprout legs and crawl back onto land. Planet Z-7 resembles Amphibios 9.